09/28/2015 This one is from UMass Memorial – Marlborough Hospital. The physical therapy department there was made aware of a discrepancy between the pieces of equipment distributed to patients and the total inventory. This is an automated process so that whenever equipment is distributed to a patient, a form is filled out so the patient’s insurance can be billed. When the paperwork is incomplete or missing, the PT department at Marlborough Hospital is billed for the piece of equipment. Karen Maloney, PTA, and Brenda Mack, MPT, designed an inventory sheet to track equipment and forms daily. When caregivers distribute a piece of equipment, they indicate so on the tracking form. In addition the team requested their equipment vendor leave a list of what items are dropped off so that it can be added to the inventory and allow for better tracking. Now, if inventory is a little off one day the team can follow up with the caregivers who worked the previous day to find out if they distributed any equipment. The team also installed separate baskets for blank forms, completed forms, and equipment delivered so that paperwork doesn’t get misplaced. This will prevent having to pay for missing equipment. Well done! 09/21/2015 This one is from UMass Memorial — HealthAlliance Hospital where their Pre-admission Testing team was going through a lot of patient booking sheets as a result of patient changes. Seems that every time there was a patient change the booking office would send a new sheet. 09/14/2015 This one comes from the emergency department (ED) at UMass Memorial Clinton Hospital. Led by Jessica Marcoux the ED nurse manager, a unit-based council was formed. The purpose of the council is for nurses and nursing leadership to meet routinely to discuss clinical and business decisions that affect the delivery of nursing care provided in their unit. This improves collaboration and increases employee engagement. Well done! 09/07/2015 This idea is from the UMass Memorial Medical Group Emergency Medicine Department. The team noticed that their flow statistics were no longer having a meaningful impact on caregivers. Partly because the caregivers were inundated with several statistics each week causing some to lose focus. The team decided to present a single metric each week called the “metric of the week” in order to focus the conversation to one topic. Doctors lead the conversation and share the significance of the metrics with the staff to impart meaning. Well done! 08/24/2015 This one is from UMass Memorial Community Healthlink, submitted by Rebecca Everson, assistant coordinator for supported housing. Caregivers were having a difficult time keeping track of when clients were hospitalized and organizing coordination around their discharge back into the community because there was no central place to communicate about this issue. Rebecca thought creating a hospitalization calendar would work. Clients initials and details on where they are hospitalized is entered on the calendar. When caregivers call to get an update they are asked to put their initials and then write in the communication log any new information. The calendar is in a central place for all staff to see and it is a visual reminder of what needs to be done and what has been done. This helps the organization to reduce work. Well done! 08/17/2015 This one is from the Medical Center Transfusion Medicine team. Manager Mindy Greene wanted to help find opportunities for high-schoolers in the community that promoted science in the workplace. She recognized that there simply wasn’t the level of community involvement. Mindy and her team worked to create a partnership with Girl’s Inc. Eureka/STEM Program to provide an opportunity for a student to spend a month in the Blood Bank, Stem Cell Lab and Donor Center this summer. “The idea was simple, we knew about the Girls, Inc. STEM program called Eureka from mailings we had received. We also know that STEM programs are popping up throughout the Commonwealth and that kids don’t have enough opportunity in science related activities. So we reached out to the folks at Girls Inc. last fall and solidified the commitment this summer. We wanted to give back to our community,” Mindy said. An added bonus for the student is opportunity to meet with women in leadership positions throughout the organization who shared their personal and professional journeys. 08/10/2015 UMass Memorial Marlborough Hospital Environmental Service Department submitted this idea which they call “Shifting blankets, reducing cost.” Since linen is charged per soiled pound thermal blankets are quite heavy and costly to launder. Mark Desmond and his team wanted to decrease the amount of thermal blankets utilized in all areas and encourage substituting with the much less dense weighted bath blankets especially during warmer months. Marlborough Hospital has substituted bath blankets in all clinical areas where possible receiving valuable cooperation from the clinical staff in a collective effort to reduce the per pound usage. Additionall they have changed the par levels on units that still required usage of both; increasing the par level for bath blankets and reducing it for thermal blankets. Since introducing the programs the hospital has seen a 65 percent decrease in the laundry poundage. Well done! 07/20/2015 This one comes from UMass Memorial Medical Group where the Community Medical Group from Fitchburg Family Practice was having a problem finding an appropriate medium for communicating the registry needs and goals to the clinical and administrative team. The existing medium was not large enough and all of the information could not be reported on a single page. Recognizing the problem, Dr. Carla Christos believed adding a large white board near the site where registry needs, goals, progress and results can be posted tracked and looked at regularly by everyone on the team. The board provides valuable patient information and is a resource for the clinical and administrative team to highlight team achievements for any given period. Well done! 07/13/2015 This idea is from Community Healthlink. Phil LeNoir, is the Assistant Coordinator for the Crisis Stabilization Unit (CSU) and Department of Mental Health Respite Beds Program in Worcester. This program provides 24 hour care to individuals in psychiatric crisis who do not meet the criteria for inpatient care but need to have increased structure while they are recovering from their illness. Phil noticed that when clients were transferred from CSU to PASSages they went up to the unit and waited in the waiting room for admission. There were often long wait times for patients to transfer from the CSU into the inpatient substance abuse program causing some clients to leave before being admitted to Passages. To improve this process for clients CSU will perform frequent hourly check-ins with Passages prior to client discharge. Once they identify that Passages is ready for the new client the CSU staff will then discharge the client and take them upstairs to promptly begin their admission. This has cut down on the wait times and has increased client satisfaction and engagement in treatment. Well done! 6/29/15 This one is involves the Benedict Family Practice on the University Campus of the Medical Center. Led by Laurie Hackett and Shelley Fitzgerald, the team used the principles of 5s to organize their supplies. First the team moved all of their supplies to one central location. The products were previously scattered around the clinic. 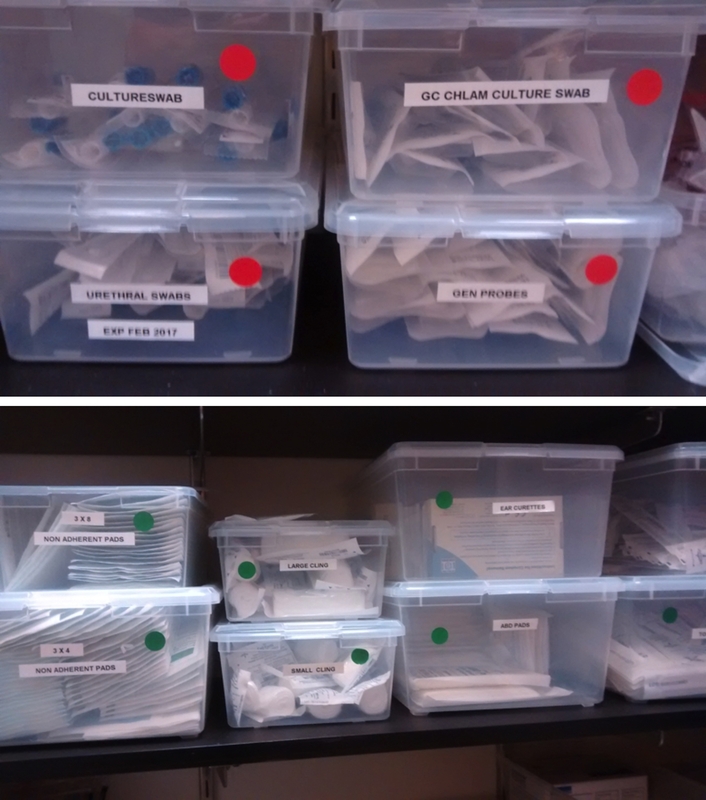 Then items were stored and organized all in clear plastic containers. The team established a new process to distinguish items with expiration dates from those without. A red dot on the outside of the container signifies supplies without an expiration date while a green dot signifies items that will expire. This allows the staff to monitor expiration dates without going through every bin. Well done! 06/22/15 From the pharmacy department at UMass Memorial — Marlborough Hospital, where the team there was looking for a way to ensure its potassium chloride IV in the 50mL bags is always distributed through the central line only. This dosage is intended for ICU patients; however, there is no distinguishing characteristic on the bottle and non-ICU patients may get access to this dosage through a peripheral line. Beginning a few months ago the team decided to label all KCL 20mEq/50mL bags with central line only stickers. The team also added the phrase “removal warning” in Pyxis so anytime the medication is removed the nurse is required to answer if a patient has a central line. If the answer is “yes,” then it is okay to administer the drug. If the answer is “no,” then it will prompt them to use the 10mEq/100mL bag. Well done! 06/15/15 As patients and their families arrive and depart from the Cancer Center at UMass Memorial — HealthAlliance Hospital (Burbank Campus), Mary Jane Ruth, Director of Oncology, and Dave Bilotta, Director of Facilities, noticed a potential safety hazard: Patients have an obstructed view of the outside as they wait for their rides to pull up to the front door. This is also a tremendous inconvenience to our patients who constantly have to walk outside to ensure their ride is not waiting. Since many patients are ill, impacted by various treatments, on medicine, at risk of falling, or in a wheelchair, they are at a higher risk of injury. Mary Jane and Dave generated the idea of installing cameras that point toward the front door of the Cancer Center. 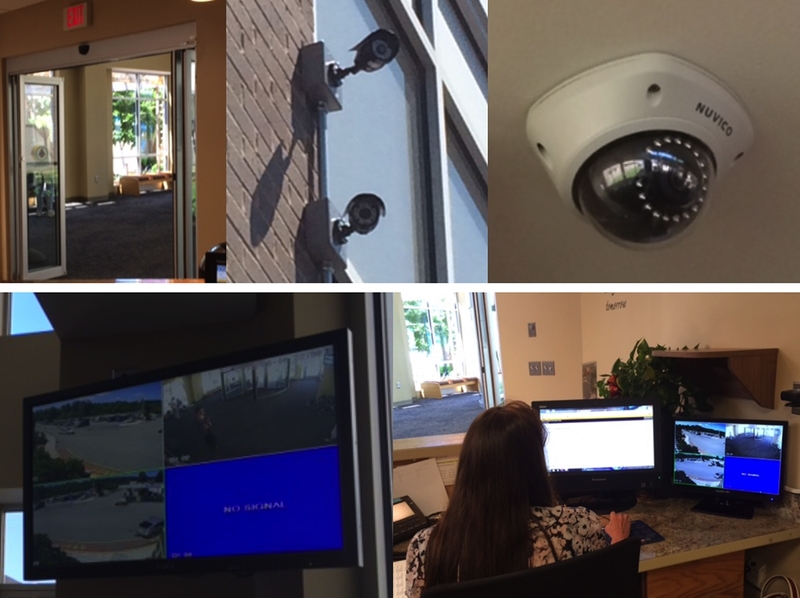 The camera footage is displayed on monitors located both in the lobby and reception desk. Now patients can check the video to see if their rides are outside waiting for them. In addition, staff members will have a clear view of the front door, enabling them to monitor safety as patients enter/exit the Cancer Center. Well done! 06/08/15 UMass Memorial – Clinton Hospital employees wanted an onsite workout facility. This prompted Sheila Daly, the hospital president and CEO, to raise the “idea” of placing gym equipment on the currently vacant second floor of the Daly Building while plans are still being made for the permanent function of that space. We liked the idea as well and awarded Clinton Hospital with a $10,000 grant from the Innovation Fund to help make it happen. Through Martha Chiarchiaro, vice president of Human Resources at Clinton Hospital, employees were able to offer their feedback on what equipment they would like to have in the gym. The hospital was able to purchase a treadmill, an elliptical machine, stationary bike, weights, exercise bands and stability balls. To ensure as many employees as possible could work out together, Sheila approved the purchase of additional equipment along with exercise flooring. The space will also accommodate a walking track that employees can use when the weather is inclement. The employee gym is installed on the second floor of the Daly Building. I had the honor of cutting the ribbon to celebrate the opening of Workplace Gym during Hospital Week and employees received a Clinton Hospital workout towel as a small token of appreciation. All employees can use the gym, but benefits-eligible employees will have an additional bonus of being able to earn points through MyHealth Matters by using the gym on a regular basis. This idea is a wonderful combination of initiatives supported by our health care system that will help Clinton Hospital employees gain the convenience of taking care of themselves while they continue to take great care of our patients. Well done! 06/01/15 Greg Seward, director of Tobacco Free Initiatives of the Department of Psychiatry, created patient education videos to be viewed on UMass Memorial Education Television. There are five videos available to patients in their rooms and in the waiting rooms on both the University and Memorial campuses. All five videos are shown in a loop and can be viewed at the patient’s convenience. Greg is looking to enhance the service through funding from our Innovation Fund. Since the videos became available in this format, the views have gone up with one reaching the top 10 of videos ordered throughout system. To get the word out about the video availability, Greg designed an informational patient handout and has provided the handout to nurse directors to be sent to the nurses as a resource tool. 06/01/15 This one is courtesy of Gavin Besmond, program director for Community Healthlink’s Crisis Stabilization Unit and Department of Mental Health Respite Beds Program in North County. Gavin’s program had a document management problem in one of its work areas. To address the issue the team reorganized a filing cabinet by purging unneeded documents and prioritizing the rest. New folders were created and documents with similar functions were grouped together. The reorganization included a color-coded system for ease of access. Finally, an inventory list is attached to the front of the cabinet detailing where a particular document can be found. The newly reorganized filing system has eliminated a lot of waste giving the team more time to focus on the services that benefit patients. 05/18/15 The Marketing and Communications team at UMass Memorial Medical Center wanted to run their idea board huddles as quickly and efficiently as possible. Because the team meets regularly and has a consistent schedule and deadline for moving their ideas through to completion, a calendar of three months was tacked right next to their idea board enabling the group to easily find the dates needed to apply to each of the ideas. This eliminated the need to fumble with a phone calendar or guess. It’s right there. The department has designed the calendar in a PDF format and has made it available to managers throughout the Medical Center. Well Done! 05/11/15 The UMass Memorial Medical Center Housekeeping Department needed a way know when the hand sanitizer dispensers were running low. The light on the dispensers indicating that the gel amount was low or had run out was difficult to see at times. So housekeeping decided to install red, yellow and green dots behind the gel so that as it is used the bag collapses from the top and the dots become visible from across the corridor and at many angles. Green represents an almost full level of gel, yellow signals that the dispenser is near half full and when red is visible the gel is almost gone. This is a minimal cost idea that can potentially be spread throughout the system. Well Done! 05/04/15 Natalie Pereira, RN, and the care team in the medical surgical unit at HealthAlliance Hospital’s had a pillow challenge. Specifically, the unit had problems finding pillows and storing them. While cleaning the orthopedic unit one day, Natalie had a eureka moment. She thought using a pillow dispenser would improve the process. Natalie’s overall goal was to improve storage, workflow and decrease the need for excess pillows. Once in place, excess pillows were removed from the unit for better management of par levels. The new process has benefited all caregivers who can now devote more time to our patients rather than searching for pillows. Well Done! 04/27/15 Recognizing that falls can happen anywhere and at anytime, especially for patients who are at an increased risk because of their present medical condition, Annette Casco, senior director of the Physical Therapy Department at UMass Memorial Marlborough worked to decrease the risk of a patient falling and being injured. Marlborough Hospital changed its medical history form to ask patients about any falls-related incidents or problems with balance. Those patients identified as being at greater risk of falling will have that information noted in their charts and will be given education on these risks and tips on how to decrease them, The staff also closely monitor the patients during their treatment and walks them safely to their car, if needed. Well done! 04/20/15 In an effort to provide a healthy benefit to patients and drive awareness of their physical therapy services, Jennifer Baer, manager, of the rehabilitation department at UMass Memorial Clinton Hospital, created and distributes small water bottles with the name of the department and phone number on the label. The water bottles are given to patients during the discharge process and when requested during their treatment. The feedback has been positive and this is a win for patients – who are pleased to have a refreshing drink and stay hydrated – and for Clinton Hospital, which has a new way to market its services. Well done! 04/13/15 For UMass Memorial Medical Group, quickly accessing information to help high-risk and high-need patients presented a challenge for staff at the Office of Clinical Integration (OCI). Many of these patients have behavioral health issues and and chronic illness. The OCI clinical care manager for the Mass Health Primary Care Payment Reform program (PCPR) and OCI project coordinator worked with Information Systems (IS)Department to load an easy- to-spot icon onto the desktop of care teams working with these patients. 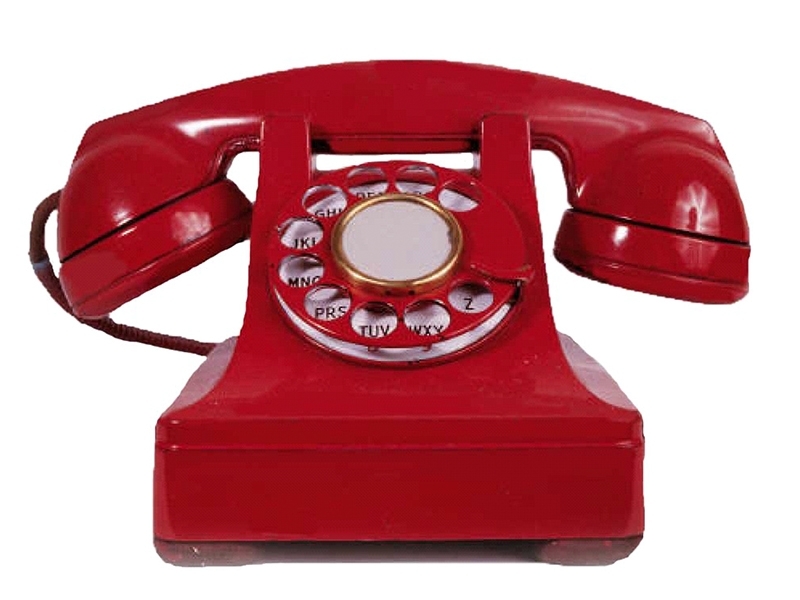 The icon, a red telephone, was installed on desktops at the seven PCPR practices. With one click, the icon links directly to a page with contact information for a number of insurance company care management programs, as well as other helpful resources. The team is also working with IS and other practice sites to expand usage of the easy-to-spot red phone icon. Well done! 04/06/15 Melissa Arrell, a Community Health link practice manager, and staff at the Homeless Outreach & Advocacy Project (HOAP) noticed there was a lack of communication between HOAP and programs referring to the program, leading to some improper referrals. The HOAP team invited staff from a referring entity to do a site visit to primary care so they could get a better understanding of their work. During the visit HOAP staff gave instructions and guidelines on how to refer and call for medications and information on direct contacts and strengthened the relationship between HOAP and the referrers. Both teams are now holding sessions on topics important to women in the program which most recently included discussions on alternative methods of pain management and Hepatitis C. Well done! 03/30/15 Members of the Division 40 team are proposing a new process to help reduce energy costs across the system. Doug Brown and Sergio Melgar suggest the installation of automatic light censors throughout the system. These sensors will go a long way toward eliminating unnecessary drain on our energy resources. The idea has been forwarded to our facilities and operations teams to make an assessment and determine the feasibility of the proposal. Well done! 03/23/15 UMass Memorial Medical Center was dealing with the problem of uncharged staff cell phones. The primary culprit was missing chargers. This required the unit clerk to use the paging system to direct staffers to where they were needed. This caused unwanted noise, disruption and inconvenience for our patients. The team then developed the “mistake-proof” idea of plugging the chargers inside the workstations on wheels (WOWs) to ensure staffs always have their phones charged and that chargers are locked in place. Even better, the team worked with their executive rounder and facilities department to make this change happen at no cost. Well done! 03/16/15 UMass Memorial Marlborough Hospital wanted to pump some new life into its “High Five” recognition award which had suffered from poor participation. Working to make the process of getting recognition better for the staff – with a focus on ideas – the team members from Marketing and Communications, Food Services and Administration added a $3 coupon to the hospital’s Union Street Café as a component of the recognition program. The High Five award form was developed and is available on Marlborough Hospital’s OurNet homepage for any employee to access and print for completion. Well done! 03/09/15 UMass Memorial HealthAlliance Hospital wanted to sustain the momentum gained from the hospital’s first full year of Idea System implementation. The hospital wanted to focus on ways to ensure ideas were constantly moving and not “stuck” in the system. Their idea was to create a multidisciplinary team to meet regularly to support the HealthAlliance Idea Board initiative. The role of this Advisory Council is to facilitate, coach, counsel, brainstorm, mentor and advocate for widespread usage of Idea System. Practicing what it preaches, the council will maintain its own Idea Board to track and manage the progress of its contribution to the Idea Board initiative. Well done! 02/23/15 UMass Memorial Medical Group team members noticed that handwritten appointment dates and times were sometimes written incorrectly on appointment cards – a process requiring re-work and wasted time on the part of caregivers. The team’s idea was to create a label that prints from IDX as an appointment label and includes the patient’s appointment date, time, MRN and nurse provider. The label is applied to the back of an appointment card for the patient’s convenience. This process has proven to be much more reliable and accurate. Well done! 02/09/15 The Medical Center’s Housekeeping team had difficulty accessing a necessary cleaning compound to effectively burnish the hospital’s floors. When the supply of the compound ran out on the carts, staff had to go through a lengthy process to get a new supply. After discussing several options, the team settled on the idea of pre-treating microfiber mops with the compound and providing them in 5-quart pails, rolled up and ready to use. The benefits included eliminating the need for a cart and a bucket; creating a nimbler process since the pail was much less cumbersome; and ensuring that everyone would use microfiber mops, which has been shown to deliver the best results. Most importantly, the implemented idea eliminated the needless waste of the compound. Well done! 02/02/15 For patients scheduled for eye surgery, the pharmacy at UMass Memorial Marlborough Hospital made a mixture of drugs in a 10mL vial in its IV clean room. As part of the process, the anesthesiologist typically took two vials for each patient, but did not always administer the full amount. As a result, even though two vials were made for each patient the hospital charged for only one. Led by pharmacist Robert Fischer, the team’s idea was to make a 20mL vial for each patient, allowing for more accurate charging and reduction in time spent in the IV clean room work. Close collaboration between the pharmacy staff and the anesthesiology Department to ensure the hospital had the correct materials – IV templates and order sets – makes this implemented idea work. Well done! This entry was posted in Idea of the Week by Eric Dickson, MD, MHCM. Bookmark the permalink.